Q. Is a Preheater utilized in advance of the Repaver? A. Yes. All projects now utilize a Preheater in advance of the Repaver. The preheating begins the softening of the existing surface to allow scarification of the specified depth. In some cases, more than one preheater is necessary to achieve the desired scarification depth. Q. What is the maximum scarification depth that can be achieved with the Cutler single machine recycling process? A. The depth can vary depending upon the thickness of the last overlay, the penetration and viscosity of the asphalt cement and the type of aggregate in the pavement surface. Generally speaking, a depth of 1 inch can routinely be achieved on most urban asphalt surfaces. Q. Can scarification depths greater than 1 inch be achieved? A. Yes. However, each pavement must be evaluated individually to determine whether the asphalt properties contained in the pavement will allow a greater depth. Typically, most urban pavements do not require depths greater than one inch. Some highway pavements may be suited for depths of 1-1/2 to 2 inches, but a thorough pavement evaluation must be performed in conjunction with a cost analysis to determine the feasibility of achieving a 2 inch depth. Q. How much existing asphalt is required to effectively recycle it with the Cutler single machine process? A. We recommend that the existing wearing surface include 1-1/2 to 2 inches of asphalt if a scarification depth of 1 inch is desired. For 2 inch depth, we recommend a 4 inch total thickness. Q. How much new hot mix asphalt is added in the recycling process? A. Typically, a minimum 1 inch of virgin hot mix asphalt is added during the recycling process, producing a combined 2 inch thickness of new and recycled hot mix. On recycling depths greater than an inch, it may be possible to lay surface courses less than 1 inch thick." Q. What is the maximum amount of new hot mix that can be added during the recycling process? A. For recycling depths of 1 inch, a 2 inch overlay is maximum. A good rule of thumb is the total thickness of new and recycled material should not exceed 3 inches. Q. 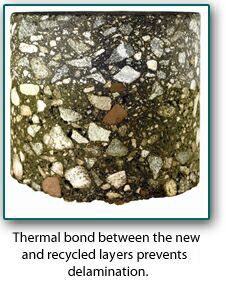 Does the Cutler process prevent delamination between the recycled and new hot mix asphalt layers? A. Our process creates a monolithic bond between the two layers (see photo). Our exclusive single machine technology heats and reworks the existing surface, creating a recycled layer that is at least 200° F at the time the new overlay is applied with the same machine. Q. What life cycle can I expect from your recycling process? A. Under normal conditions, our recycling projects will deliver at least 7 to 12 years of service (See Pavement Lifecycle Cost Per Year chart at bottom of Economic Benefits page). However, some Cutler projects have delivered as much as 19 years of service before subsequent resurfacing was required. Q. Can the Cutler single machine recycling process be used in conjunction with SuperPave technology? A. Yes. Cutler's hot in-place recycling process is an ideal solution to remove rutting and surface irregularities prior to laying down new SuperPave surface course. Our process saves time, materials, and money by utilizing the recycled material as a leveling course.